In Halifax, there is a least one apartment complex that was repurposed from a former church building. Every time I pass by it I can’t but help but wonder what happened that caused the church to close. What went through the minds of the minister, the congregation, and even the community when the last service was held? Was their sadness, regret or even anger? For the longest while I could not imagine how a church could fold yet it happens. This Sunday my church will be closing its doors after 18 years in the city. I attended their first service and will attend their last. There is a sense of failure and a sadness amongst the leaders that somehow, we let God down. There were signs developing over the past few years that suggested we weren’t as healthy as we thought. Tithing and volunteerism were decreasing and too many in the family felt it was Ok to worship together once or twice a month vice every Sunday. As I reflect on our closure the words Jesus shared with His disciple about His pending death come to mind. Jesus said, for God’s will to be done He would be taken prisoner, tortured and crucified. Peter’s response was “no, that won’t happen to you”. He was immediately rebuked with these words spoken by Jesus, “Get behind me, Satan! You are a stumbling block to me; you do not have in mind the concerns of God, but merely human concerns.” Matthew 16:23. I had wondered if our church failed because many did not have the concerns of God in their heart but their own desires. I recently read a quote that said we should not judge the behavior of our Christian brothers and sisters; we should leave that up to God. Our role in the Kingdom is not administration but advertising. We must focus on bringing the Good News to others and trust God to stir hearts. The Church was created for glorying God, honouring Him with our worship and taking His message of hope and salvation to the lost. It is made of those seeking God and wanting to do His will. People who are part of a congregation are at various stages of spiritual growth and so we must be gentle, encouraging and loving. We can’t help but notice those by-stander Christians amongst us who have been around for many years but who don’t come every week, slip in and out of service, and rarely step up to serve. We can’t be angry at these people but must encourage them because we know they are missing out on the joy of belonging to a family dedicated to serving God. During the same conversation where Jesus rebuked Peter He also said, “Whoever wants to be my disciple must deny themselves and take up their cross and follow me. For whoever wants to save their life will lose it, but whoever loses their life for me will find it. What good will it be for someone to gain the whole world, yet forfeit their soul? Or what can anyone give in exchange for their soul?” Matthew 16:24-26. Bystanders are most likely good people who have not understood what it means to be true disciples. Something is missing, and they don’t realize that being on God’s mission require commitment and sacrifice. In hind site, it will be easy to suggest what went wrong in my church. I imagine that those who cared will not gather to talk about it because it would be too painful. Hopefully, all of us, including those reading this article, will reflect on their own involvement in helping the kingdom move forward. 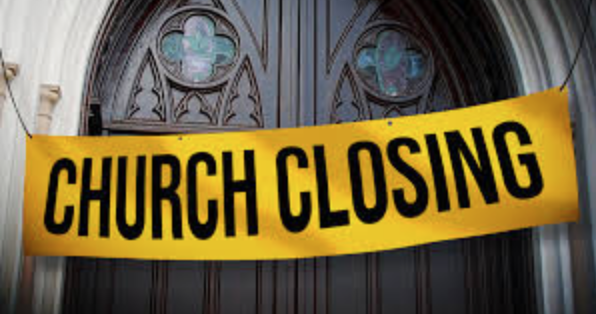 It’s also no consolation to know that all those churches that received Paul’s encouraging letters are now closed. What is comforting to know that despite humanity’s self-interest the kingdom keeps on going. Pray for your church and the MCF so that God’s will can be done.